I arrived here from France with a draft of about a hundred and twenty on Friday. On Saturday morning the twelve of us who were going for commissions in the Machine Gun Corps were paraded before Gen. Richardson who told us were all old hands and had been recommended for good work on the field that we were to be granted out Commissions immediately. So now you see me as 2nd Lt. in the N.Z.M.G.C. with seven days leave in which to buy my kit before reporting to the M.G. base at Grantham. It will be at least a month before I am returned to France very likely it will be two or even three. We consider ourselves lucky in not having to go through the usual six weeks course at an Officers Training Corps. School also in missing the next push which our fellows will be into before many weeks are gone. My address will now be 2nd Lt. M.G. Corps. N.Z.E.F. France. Gordon McDonald is over here somewhere on leave just as present but I have not struck him as yet. He will most likely be down at Rochester with his uncle. I am going to take a run down there some day this week. They allow us £25 for kit allowance but it cost about £50 to get fitted out so that I will probably have to draw in the next day or two. 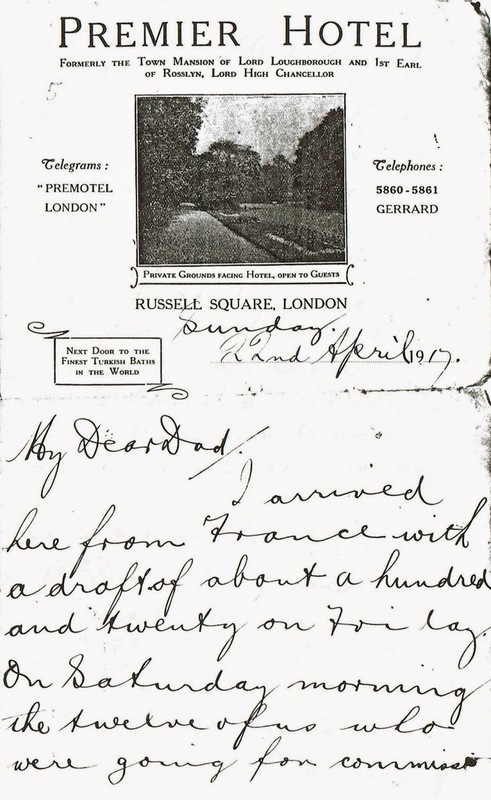 I will do so through Messrs Bruce and Lion Cooper's London Agents with whom Bob made arrangements for me to draw. I was sorry to hear of Mr McDonald's sickness and trust that he has quite recovered before now. Labels: leave, London, Machine Gun Corps.